NU’s beloved dining hall as a 1960s hospital and more. This winter break, I binge-watched “The Man in the High Castle” on Amazon Prime. If you haven’t heard of it, it’s a dystopian show based on a book by the same title that depicts an early 1960s universe in which the Axis Powers have won World War II and Nazi Germany and Japan have taken control of America. My eyes did not deceive me. Sargent Hall, home of arguably the longest lunch lines in the Western Hemisphere, also makes a guest appearance as a rehabilitation hospital. I was immediately curious. Why, out of all the buildings in the world, did the exterior of Sargent immediately scream “vintage Nazi hospital” to a location scout? I did some digging and found that “The Man in the High Castle” did absolutely no filming in Evanston or Chicago. The vast majority of it was done in and around Vancouver and Seattle. Something didn’t add up, but then it hit me: this wasn’t the first time I’d seen Sargent used as a hospital on screen. In the 2008 film “The Express” (a biopic on Ernie Davis, the first African-American Heisman Trophy winner), various scenes were filmed on or near campus. Ryan Field, for example, was used to represent Dallas’ Cotton Bowl. Near the end of the movie, when Davis is in a Cleveland hospital for leukemia treatment, the establishing shot used for the early 1960s hospital was, again, the front of Sargent Hall. Interestingly enough, the cars are parked in the exact same places as they were in “The Man in the High Castle.” In fact, it’s the exact same shot as the one used in the movie. The only differences in the show version are the people who appear to have been airbrushed out, a "Reich Rehabilitation Hospital" sign on the front and some alterations to the lighting. The movie and show were made by two different sets of production companies, so the only way the show would have access to that footage is by buying it from somewhere else. After sending out to every one of the six production companies credited with helping film “The Man in the High Castle,” only Jack Glascott from Scott Free Television got back to me. Coincidentally, Glascott works for executive producer David Zucker, who is a Northwestern alumnus. After some investigating on their end, (and apparently to the bewilderment of Zucker, who probably doesn’t usually deal with things of this nature), Glascott was able to confirm that it was, in fact, purchased footage of Sargent Hall. 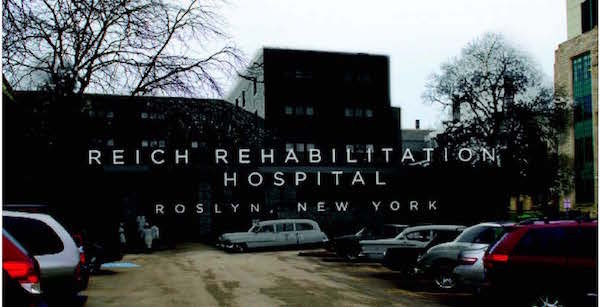 “I’d imagine it’s repeatedly showing up as the exterior shot for a hospital in various productions because it’s listed as a hospital stock shoot from wherever it’s being purchased from,” Zucker said in an email. Unfortunately, Getty Images never got back to me about the origin of the shot that unmistakably looks like Sargent. Ostensibly, the shot was filmed so long ago that the rationale for likening Sargent to a vintage hospital has been lost in the shuffle of time. This is where my quest for the truth came to a screeching halt. But your quest has just begun, and the time is nigh to #StayWoke. Keep your eyes peeled the next time a 1960s period film or television show pans over to a hospital scene, because you never know – Sargent could be making another cameo. A look back at Sargent Hall. NBN’s definitive guide to on-campus housing. © North by Northwestern, 2016. All rights reserved.